Being from Milano, risottos hold a special place in my heart. The richness, creaminess and texture, the incredibly rich flavor and endless variations that these humble preparations are capable of offering have few matches in the Italian culinary world. There is one for each season and one for each taste. From the healthiest, vegetarian varieties, prepared with seasonal vegetables and vegetable broth, to the most indulgent seafood based on shellfish and crustacean meat and broth, to the cheesiest and meatiest prepared with rich meat broth and braised meats or melted cheeses. Risottos are like a world of their own, where only your imagination and good taste are the limit, once you master the basic technique. To start, a good quality rice is the key. 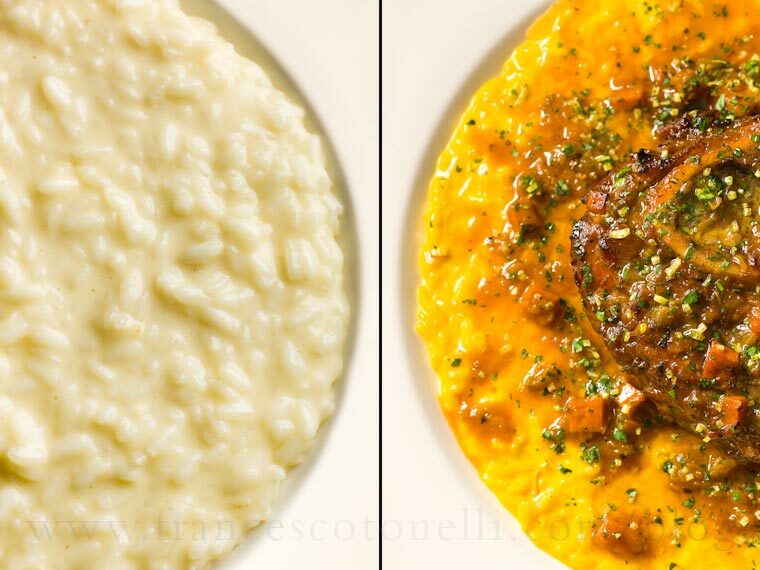 Arborio is probably the most known risotto rice variety here in the US, but Carnaroli and Vialone Nano are also excellent. The cooking liquid, should not be underestimated as it is responsible for a great deal of the flavor in the final preparation, and in most cases, making a quality broth can also be a wonderful way to utilize trimmings from the main item, such as fish bones and crustacean shells would do in a seafood risotto for example, thus making risotto a great example of "total utilization". The method begins with a flavorful soffritto, too often overlooked and rushed and most of the time, as simple as finely chopped onion or shallot slowly caramelized in olive oil or butter. This soffritto provides a great foundation of flavor and if allowed to slowly develop sweetness can make an enormous difference. The preparation continues by adding the rice to the soffritto and allowing it to be coated in the fat for a minute or two until is shiny and warm to the touch. From that point, you just add enough hot liquid to barely cover the rice and allow it to cook by gently simmering, with an occasional stir and the addition of hot cooking liquid as needed. The cooking time really depends on the rice variety, but is normally between 13 and 17 minutes. One of the most important things to pay attention to here is adding just the right amount of liquid, particularly toward the end of the cooking time, so that the rice does not overcook. The key is to be able to achieve a creamy bonded texture simultaneous with rice grains being cooked al dente. If too much liquid is added toward the end, the risotto will either be too soupy or in trying to reduce the liquid, too mushy. Moreover, draining the extra liquid off is really not an option since doing so would mean pouring developed flavor down the drain, as well as the starch needed for a smooth, bonded texture. Very small amounts of liquid can be added conservatively and strategically, however, even up until the moment before serving as a rescue measure if the texture of your risotto becomes too stiff - so it really pays to be careful with the amount of liquid throughout the cooking process. The creaminess I was referring above is achieved in the last phase of the preparation and is called mantecatura in Italian, which consists of moving the risotto off the heat just before the grains of rice are cooked through (remember that the rice will keep cooking for a few minutes even when off the heat, so plan accordingly) and stirring vigorously while shaking the pan on a flat surface, which results in a thick, liquid creaminess. Generally a fat and flavoring agent are added at this point and most of the time consist of butter and grated Parmigiano Reggiano. Butter, however, can be substituted with extra virgin olive oil or heavy cream or Mascarpone cheese, for example and Parmigiano can be interchanged with other cheese varieties or even fresh herbs, depending on the desired outcome and the main flavor of the risotto. - cooking and pureeing the stems and adding them to the risotto while cooking and then garnishing with sauteed tips. - cutting the asparagus in pieces and adding them to the risotto while cooking so that they cook together at the same time. - cutting the asparagus and cooking them entirely separate and serve them on top of a basic Risotto alla Parmigiana. In the end, it is all a matter of preference that produces significantly different results with the same ingredients, a bit in the same way that drinking a shot of Espresso alongside a glass of milk is quite a different experience than drinking a Cappuccino. One last thing to remember, which is something I remind even myself over and over again is that no matter how many creative and delicious risotto variations there are out there to taste, I always seem to go back to the most basic, Risotto alla Parmigiana, as one of my favorites - prepared with an excellent meat broth and finished with butter and Parmigiano. Here is where the technique can be easily practiced and the art of simplicity prevails.